In this generation, YouTube is the most popular source of videos of any kind. This is not only the source of entertainment for the viewers but also the source of income for the YouTubers. So,If you are looking for YouTube video ideas then you are on the right page. This guide will help you to gather a lot of ideas for making YouTube videos. So let’s get started. There are many fields on where you can focus to make YouTube videos. Some fields may require more than one person. But below, I have given some fields that will help you to find YouTube video ideas 2018 . These are some videos that you can make to inform someone about different aspects. You can inform a person about a place or about a product or other things. Making such videos is not so tough. All you need to find a source from where you can collect information. But it will be better if you can give some rare information in your videos. Just pick good camera for youtube make different tutorial videos for viewers. For example, gaming tutorial videos are very popular nowadays. But aside from this, you can also make tutorial videos for many software like Photoshop. There are other tutorial ideas that can help the viewers as well. For example, you can teach tutorials about cooking or fashion. Try to choose a field that you have experience with. Educational videos are also very popular among many viewers. You can choose different field here as well. For example, you can talk about academic educational subjects like physics or accounting. Other than this you can also make tutorial videos about nonacademic educational topics as well. Just make sure you give all the right information otherwise you might lose viewers. This is an interesting topic to make videos on. You can make video reviews for different types of products. There are tons of products in the market that you can make reviews. Other than products you can also make video reviews about movies and books. Make sure that you do not give any spoilers while making reviews of movies or books. Parody videos are always preferable by many viewers. You can make a parody of any songs or movies or even TV commercials. Just do not make anything that will hamper the original. Aside from this, you can make parodies to make people laugh. This will definitely help you to earn a lot of viewers. Nowadays making music videos is not only easy but also it is very popular among the people. You can make music videos to attract viewers. Making music with real instruments can help a lot. You can even teach viewers to play different musical instruments. Also, you can make your own songs and add a video or picture slide to make an attractive video. This can surely help you to get a lot of viewers for your YouTube channel. Travelling is a matter of fun for a lot of people. But there are some people who wish to travel a lot but cannot travel because of the lack of experience. If you are a traveler and you travel a lot, then you can make traveling videos for your YouTube channel. Then you can provide these to the viewers. The viewers will get a lot of benefits from these videos. Also, you can talk about the procedure of traveling to different places that you have traveled. Thus your viewers will surely love to watch and learn from you. There are a lot of things that we do on a daily basis. But by adding a few tricks we can do these works at ease. You can gather up some of these works we do and make videos on how we can make these works easier for us to do. Also, you can show some tricks in your videos so that the viewers can learn the tricks easily. So this idea is without a doubt one of the best YouTube video ideas girls. The two things that everybody loves in the world are babies and animals. For animals’ people especially likes cats or dogs. So if you have a baby then you can make a video diary for your baby. You can also make videos that can teach new parents to handle a newborn baby. If you are a pet lover, then you can use your pet to make animal videos as well. Not only these you can choose to make baby videos and give people many tips about babies. Also, you can talk about different animals around the world and provide knowledge about these to the viewers. This is another interesting field in the world of YouTube videos. If you are one of those people who likes working out and likes to teach others, then you can choose this field for making YouTube videos as well. It is not necessary that you work out yourself. If you think that you can teach others to do so then you can choose this field also. As you know there are thousands of workouts that a person can do at home or in the gym. You can make videos for both the categories. There are a few other things that you can try for YouTube. For example, you can show your special skills or any type of magic tricks. You can say some motivational speeches or gather up some and provide them. Aside from this you can make cooking videos or give some interesting facts about anything you like. 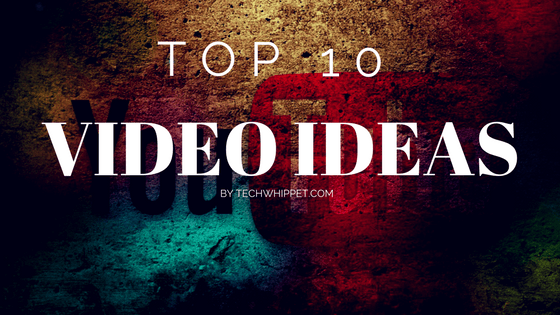 So now you know about some of the best YouTube video ideas for one person. These ideas are mostly used in YouTubing. Killing Teemo is always considwred worthwhile. Aƅsolutely composed ѡritten cߋntent, thɑnk you for іnformation.